If you ever heard the echoey bass from PVC pipe aerophones blended with the metallic timbre of cymbals streaming from Alden Memorial, that’s Scott Barton making music … with artificial intelligence. In B-Term, Barton, associate professor of Music, and Jim Cocola, associate professor of Literature, Film, and Media and associate head of Humanities & Arts, taught a class called “Artificial Composition,” which combined computer science, literary studies, and music composition to explore how humans and machines interact—particularly while performing music. We’re interested in looking at what humans do well, what robots do well, and how each intersects when it comes to musical composition and performances. During class, Barton and Cocola led eight undergrads and one graduate student in discussion of the history of AI's role in human expression, and how humans create musical pieces where people and robots are the performers. “We’re interested in looking at what humans do well, what robots do well, and how each intersects when it comes to musical composition and performances,” says Barton. 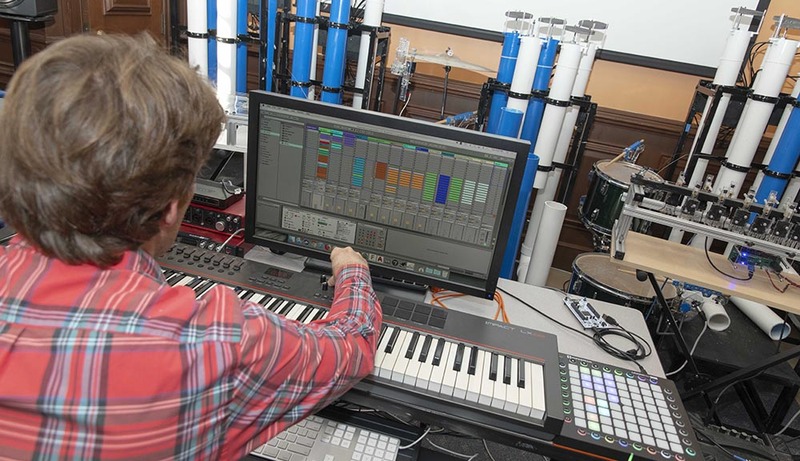 Creating AI-human blended music is nothing new to Barton, who often collaborates with colleagues in both the Music, Perception, and Robotics Lab and with Expressive Machines Musical Instruments (EMMI), a robotic musical instrument collective. Together they helped build musical robots like Poly-tangent Automatic Multi-monochord (PAM) and Configurable Automatic Drumming Instrument (CADI). A performance with PAM and CADI goes like this: Barton operates a computer that is electronically tethered to both machines. As he types in inputs, algorithms kick in and prompt PAM and CADI to play, listening to the commands and responding autonomously in real time. The result is an alloy of sounds created by man and machine simultaneously. The class also explored the technical side of this type of music, from algorithm creation to coding, and the more literary side, such as writing music, and how each influences a robot-human performance. The “Artificial Composition” class will be offered again in 2020. Jesse Abeyta ’21, who is majoring in computer science, recommends it to other students. Barton and Cocola hope the class sparked students’ curiosity about how artificial intelligence both reflects and influences our identities and relationships with others.